The state of Alabama became a territory in 1817 and a full-fledged state on December 14th, 1819. It would be logical then to have the 100th anniversary coin issued in 1919. 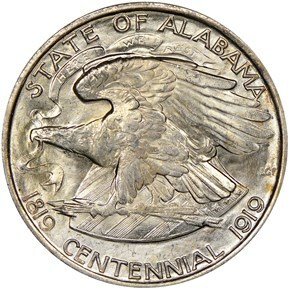 However, this was not the case with the Alabama Centennial Half Dollar. The actual idea for the coin was not even devised until 1920, a year after the centennial of the state. However, the Alabama Centennial Commission went ahead with the plan for a commemorative quarter (later revised to be a half dollar) anyways. 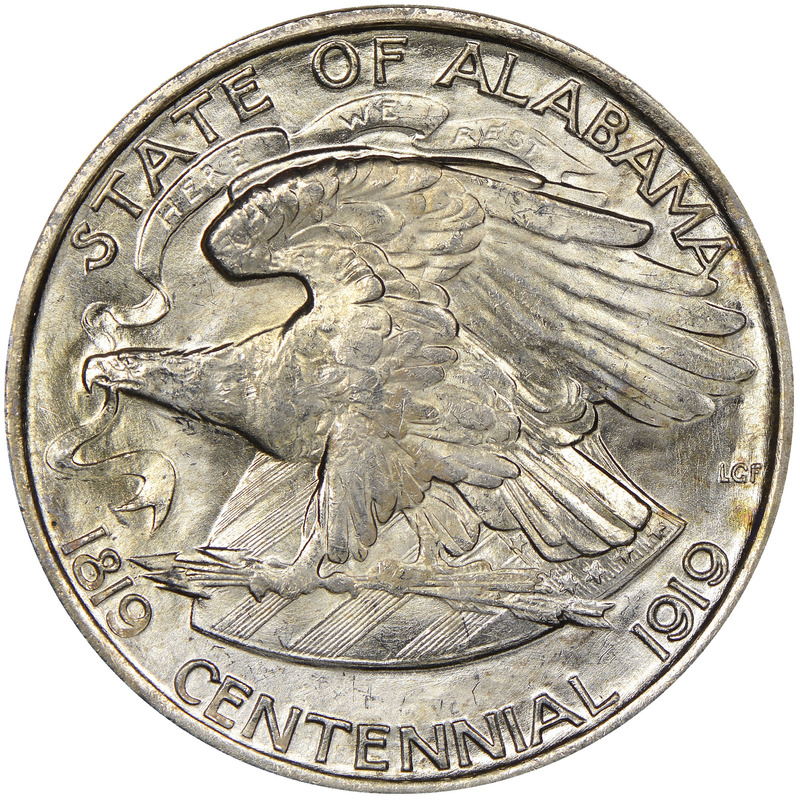 On May 10, 1920, a bill promoted by the Commission passed through Congress authorizing the mintage of 100,000 silver half dollars commemorating Alabama’s admittance to the union. However, this legislature did not explain what the actual design was to be and thus a drawn-out design process was implemented. After over a year of back-and-forth, the final design was proposed on June 28th, 1921. The obverse design was to depict William Wyatt Bibb and Thomas E. Kilby who were the governors of the state in 1819 and 1919 respectively. The reverse would have the seal of the state as well as the years 1819 and 1919. 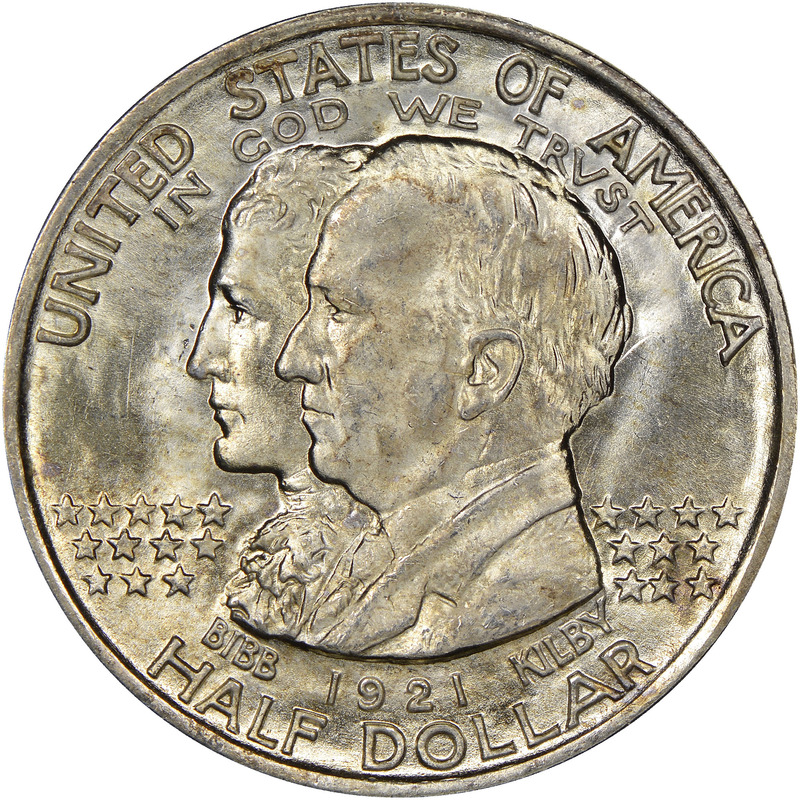 Minting finally began on October 21st, 1921, and included a special notation, 2X2, in the right obverse field. This notation had dual meanings. Alabama was the 22nd state admitted to the union, and the X was to represent St. Andrew’s cross from the state flag (as well as that of the Confederacy.) However, this design element was removed from the master dies after the first run of 6,006 pieces, and according to Q. David Bowers, may or may not have been used again to strike an additional 10,008 pieces later that year. 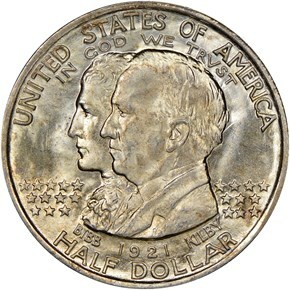 In the end, the total mintage of the Alabama Centennial Half Dollar, both with and without the 2X2 element, was 59,038.